Thank you for hosting, Diane, and thank you too for the leaf poem. Our leaves were very pretty this season, but today they were overshadowed by SNOWFLAKES! The seasons roll on. Today I have an original poem, "Round and Round", about a nest. http://www.poemfarm.amylv.com/2011/10/round-and-round.html A. Just love that first stanza! I'm in with a couple by Naomi Shihab Nye - whom I just had the pleasure of seeing read these live at the Teacher's College Saturday Reunion. Hi! it's actually GatheringBooks - not Gathering Words. :) Thanks for hosting! Also liked the poem you shared. :) Robert Frost a must for the season. Thanks for hosting (and for the Frost)! Hi Diane! That's a great photo you found -- goes with the poem perfectly. Thanks for hosting! Good morning and thanks for hosting! I'm in today with "Totem" by Eamon Grennan. I can always love a Frost poem or a leaf poem. Great choice! Today I have a video of Micah Bournes reciting his poem about "normal" hair. Thanks for doing the round up! Leaves and leaves and more LEAVES! We are blessed to live in an older neighborhood with lots of big old trees. 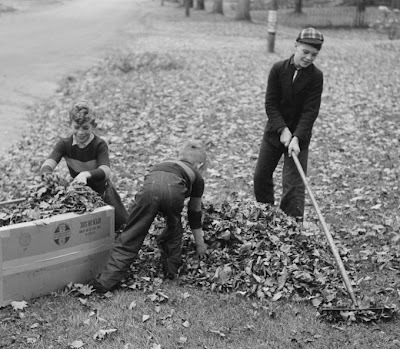 The first of the leaves have fallen, and the neighborhood streets have been lined with a dozen-dozen bags/cans of leaves at the curb for yard waste recycling. In my classroom, we learned about why leaves change color and why the trees don't need them any more. One of my students wants to know, Why is sugar a good food for trees, but not for us?! I digress. This week, I'm reviewing Laura Purdie Salas' new book, BOOKSPEAK! : POEMS ABOUT BOOKS. Hi Diane! I chimed in last night but my stuff isn't in the roundup yet, so here it is again. Thanks! I love this post! What a beautiful, enduring poem. Our leaves are just beginning to peak around here. Recent rain has added some melancholy, though. Today I'm responding to Jon J Muth's picture book adaptation of Dylan's "Blowin' in the Wind." Have a beautiful weekend, Diane, and thanks for hosting today!! Such a cool book! :) Get your unicycles ready. . . Thank you, Diane, for hosting. It'll stop for me when I have finished gathering another 40 bags of those pesky leaves. In the meantime, on my blog, it's a happy time for the beautiful Penelope, who has been faithful and true while she's been waiting for twenty years for her husband Odysseus to return from the Trojan War. Joining in the fun at Write. Sketch. Repeat. I guess it must Frost weather this week because the weather yesterday reminded me of a different poem of his, "Now Close the Windows". Thank you for hosting, Diane, and for your thoughtful teasers linked to each post. The Frost poem is perfect today. What different kinds of weather we're all experiencing this weekend! "Next to nothing for use. We're dealing with pine needles here--not nearly as romantic as drifting leaves. Thanks for hosting! Here's my post for today. I HATE it when my Google account won't let me comment on a blogger blog. Trying again, but shorter. Love this Frost poem, especially the very first stanza. Delightful! Thanks for hosting, Diane, and for the Frost poem. One can never have too much Frost. I love him. I'm in this week with a book in verse that I'm using for history with my daughter. It's here. Thank you for hosting! I also enjoyed the autumn leaves poem. Here in Wisconsin, we were treated to a brief glorious splash of color, and then a storm knocked all the leaves down. I've posted an original poem about the secret to publication at TeachingAuthors.com. Thanks so much for posting today! At Wild Rose Reader, I have a post about poetry for Halloween. It includes a review of Calef Brown's HALLOWILLOWEEN and links to my reviews of other poetry books just right for reading at this time of year. Thank you, thank you, thank you for hosting! i'm in this week with a true story of the abraham lincoln coconut vampire turtle... cake. crazy, but true. thanks for hosting, and stay warm this weekend! My selection is "Holiday Stew: A Kids Portion of Holiday and Seasonal Poems" by Jenny Whitehead. My original is about the home by the sea we have just purchased and have been in and out of taking measurements and just sitting with it. It's stood vacant for many, many years. It's time for some new life! Loved your Robert Frost contribution. Thanks for the great job hosting, Diane! Better late than never...I'm sharing one of my favorite sites this week: Poetry 180. Diane, I love your Poetry Friday roundups so much! As convenient as Mr. Linky is, there is something so wonderful about how intimate this feels. Thank you. And thanks for your comments about my interview at Robyn's. I'm a bit disappointed in this year's color show too. Sigh. Hope the storm didn't get you! Thanks for your kind words, Irene. I take the day off from work so that I can actually visit all the blogs and thoughtfully comment. I couldn't do it otherwise. Fortunately I have a gazillion hours of earned time saved up! The storm got us, but I have power, while a lot of people I know have been out since last night. Keep warm.